Like a lot of kids, seven-year-old Indiana resident Jordan McLinn has a dream job. “I like being a fireman. And I like rescuing people,” Jordan said. But unlike most kids, Jordan is in a fight for his life, and he’s hoping his advocacy will lead to saved lives for terminally ill patients. Jordan was born with Duchenne Muscular Dystrophy. As he ages, his muscles will slowly stop working. Most kids with DMD end up in a wheelchair by the time they’re a teenager. Life expectancy is just 27 years. 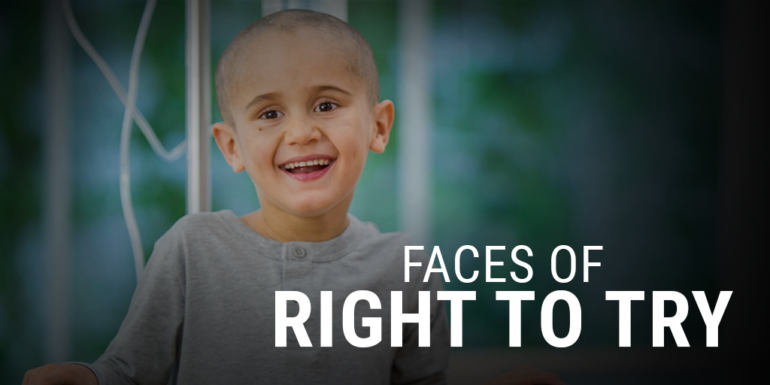 With no cure and few options for treatment, Jordan and his family have become vocal supporters of right-to-try. Right-to-try laws allow terminally ill patients to access potentially lifesaving experimental treatments that haven’t received final approval from the FDA. So far, 40 states have passed right-to-try, and Jordan was instrumental in getting the policy signed into law in Indiana. He testified in front of the state legislature, dressed in his fireman gear from his job as an honorary member of the Indianapolis Fire Department. “To me, as a mom, it’s a miracle when someone says ‘hey, this drug can add 50 years to your son’s life’,” Jordan’s mom, Laura, told lawmakers. Jordan’s dad, Jeff, reminded lawmakers that the lengthy FDA approval process could mean that by the time a treatment is approved, it could be too late. “And at that time, he could already be in a wheelchair instead of walking around with us,” he said. The bill passed unanimously. At the signing ceremony, Jordan, dressed again in his fireman gear, helped then-Governor Mike Pence sign the bill by handing him the pens. But Jordan and his family aren’t done. While right-to-try legislation has been successful in Indiana and other states, it still hasn’t been passed on the federal level. That’s why last year Jordan flew to meet with his friend Mike Pence again and testify in front of Congress with his mom. There’s hope for getting right-to-try to President Trump’s desk this year. Both chambers have passed their own versions of right-to-try legislation. But neither the House nor the Senate have any plans to reconcile the two bills. For Jordan’s sake, and for the sake of all the other Americans who are running out of time and options, Congress needs to act quickly and pass a finalized version that can be signed into law. Send an email to Congress leaders telling them it’s time to give terminally-ill patients another chance at treatment.